The University of Minnesota College of Veterinary Medicine (CVM) held its annual Points of Pride Research Day on October 2, 2013 to celebrate the CVM’s research program and honor faculty, fellows, students, and research partners who contribute to the advancement of biomedical sciences and veterinary medicine. 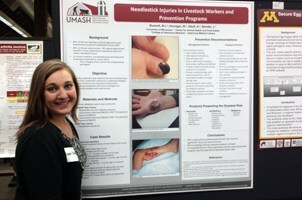 Mindy Buswell, UMASH staff and CVM veterinary resident, presented “Needlestick Injuries in Livestock Workers and Prevention Programs” in the Poster Session. Darby Murphy, UMASH staff and CVM veterinary public health resident, presented“Characterization of air contaminants associated with type of swine production facilities” in the poster session.